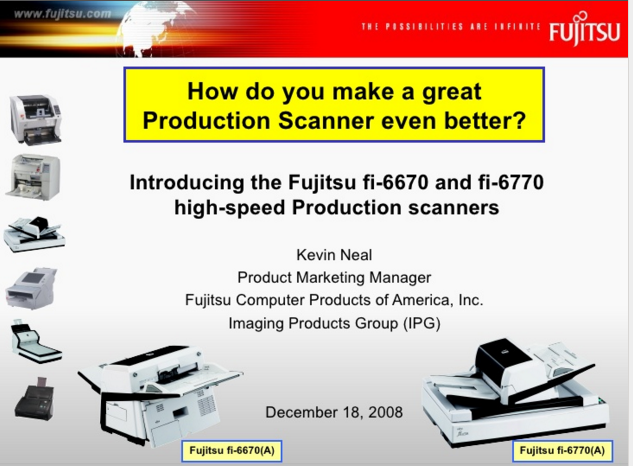 This was a presentation that I put together to introduce the Fujitsu fi-6670 and fi-6770 low-volume production document scanners. I was very proud to represent these products as Product Manager and had the utmost confidence in the technology because of great engineering and fantastic support. These are simply the best scanners in their class, bar-none. With the introduction of these four new models Fujitsu was able to regain the #1 market share position in the LVP segment in North America. It was a great accomplishment against very tough, and aggressive competition. As with all my presentations I like to focus on the practical benefits of the technology and less on feeds and speeds. These scanners can offer an amazing return on investment in terms of time savings to reduce labor costs associated with document imaging solutions. As always please let me know if you have any questions or comments.